Dr. Mumin Chen is associate professor at the Graduate Institute of Political Science, National Chung Hsing University and member of international affairs section, Taiwan Think Tank, in Taiwan. Chen earned his Ph.D. in International Studies from the Graduate School of International Studies, University of Denver, USA (2004). Previous experiences include adjunct lecturer, School of International Studies, Peking University (2001-2002); special assistant to Vice President of Taiwan (2002-2004); assistant professor, National Changhua University of Education (2004-2008); visiting research fellow at East Asian Institute, National University of Singapore (2008); and visiting scholar at Department of East Asian Studies, University of Delhi (2009); and visiting fellow at Observer Research Foundation (2011-2012). He is the author of International Security Theory: Power, State and Threat (in Chinese, Wu-Nan, Taipei: 2009) and Prosperity but Insecurity: Globalization and China's National Security 1979-2000 (Lambert Academic Publishing, Germany: 2010). Chen's research focuses include: international security theory, Chinese politics and foreign policy, and South Asian security. 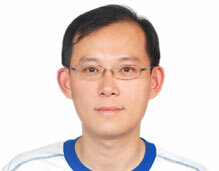 At present Chen is conducting a research on recent trends and developments of India-China relations.